TekVisa Software – Get the latest connectivity software to communicate with this product. Compatible Probes – See the probes that are compatible with this product. Warranty and Serice Information – Get warranty, calibration, and service information this product. Pulse Width mode: Counts pulses of enough magnitude inside the 250 ms measurement window that qualify as triggerable events (e.g. all narrow pulses in a PWM pulse train if set to “<” mode and the limit is set to a relatively small number). The following PC configuration represents the minimum requirements needed to install the Courseware software. To properly analyze signals you need to make sure that you can see them in enough detail. The TBS1000B-EDU comes standard with a 7-inch high resolution TFT display for a clear view of all of your signals and critical on screen information. The instrument is further enhanced by a user interface inspired by the award winning Tektronix MSO/DPO series of instruments. The interface is easy to use, provides quick access to all of the oscilloscope functions and includes a high resolution “Pan & Zoom” feature enabling you to see even more signal details of up to 10 times normal resolution. With up to 200 MHz bandwidth, 2 GS/s maximum sample rate and 3% vertical measurement accuracy the oscilloscope allows you to see all of your signals details. With the Tektronix proprietary sampling technology there are no compromises, you will get the stated real-time sampling rate on all channels, all the time with at least 10X oversampling. The sampling performance is not reduced when changing horizontal settings or when using multiple channels, enabling you to see the true characteristics of your signals. The TBS1000B-EDU oscilloscope enables students to learn about the advanced triggers used to debug today’s complex circuitry. Standard rising or falling edge, pulse width and video trigger set-ups will allow students to quickly isolate signals of interest and investigate alternative triggering options using the flexible trigger set-up menus. Once signals are captured, the TBS1000B-EDU offers advanced math and measurement capabilities making it easy to evaluate signal quality . Users can quickly add, subtract and multiply waveforms or use any one of 34 automated measurements to quickly and reliably calculate important signal characteristics such as frequency, rise time or overshoot. To further enhance the teaching process, the oscilloscopes “Autoset” function can be disabled. For those beginning labs where it is important for a student to learn the basic operation of the oscilloscope, disabling Autoset will help them apply their knowledge of an oscilloscope’s operation instead of taking shortcuts with the Autoset button. This feature is password controlled so Autoset can be disabled or enabled by accessing the Autoset screen in the Utility menu. The “Autoset” function can be disabled or enabled by entering a password in the Utility menu. The TBS1000B-EDU also comes with built-in dual channel frequency counters. Independent control of each counter’s trigger level provides an easy way to monitor two different signal frequencies simultaneously. Dual channel – 6 digit frequency counters come standard with all TBS1000B-EDU models. The innovative Courseware feature sets up an education ecosystem by combining powerful PC Course Editor software with the TBS1000B-EDU instruments and a Courseware landing page. The new feature gives educators the ability to create lab descriptions and instructions and then upload the material directly onto a TBS1000B-EDU oscilloscope. Existing labs can be modified with content that directly supports recent lectures or explores new ideas discovered in class discussions. Students can perform their lab work directly on the oscilloscope and record their progress in a report file consisting of oscilloscope screen captures. Courseware materials can easily be shared between different labs, professors at the same institution or even between educators from around the world. The Tektronix Courseware Web Page is set up to make it easy for educators to share their own course material or get inspired by reviewing new and interesting ideas from their peers. The basic building block of the Courseware content is the Lab section. An overview, equipment set-ups, theory discussions and step by step instructions can all be included in this section. When the labs are completed a course can be created. In general, a course is made up of several labs with related topics, for example a basic digital course may consist of lab topics that include; “Basic Boolean Logic”, “Simple AND & OR Gates”, “Clocks”, “Metastable Devices”, “Memory Devices”, etc. Individual Labs can be shared among multiple courses enabling professors to cater course material to a specific audience. Once all of the courses are defined a package/workspace file is created which contains all of the courses with their related labs and enables the content to be uploaded onto a TBS1000B-EDU oscilloscope. To accommodate regional differences the Courseware PC software and the help wizard support is available in 11 different languages. The Courseware PC interface uses Labs to build courses. The courses are then used to build packages which are uploaded to the oscilloscope. When the workspace file is loaded onto an instrument, students can easily access the content by using the dedicated “Course” button located on the front panel. Using the oscilloscopes soft keys and the multipurpose knob, students can access up to 8 courses which can have up to 30 labs each. To accommodate situations where and instrument is used for several classes, up to 100 MB of course material can be stored on the oscilloscope. Once a lab is chosen, the student is able to review the overview section, perform the lab using the step-by-step procedure, collect data, check & save the data results and generate reports that show the waveforms created for each step in the procedure. And all of this work can be done directly on the oscilloscope. The Courseware menus accessed by the oscilloscope soft keys provide easy access to all of the Courseware features. To help educators find new and interesting ideas for creating content for their labs Tektronix has created a Courseware Web page. At this site, users can download and customize relevant course material or upload material to share their own labs with peers. The site also contains a comprehensive search engine that allows visitors to search for labs by key word, author, category, topic and/or language. Although registration for the site is required, once registered, users are able to download or upload material and they will also be able to comment on material that they’ve used. A powerful search engine makes is easy to find material of interest. 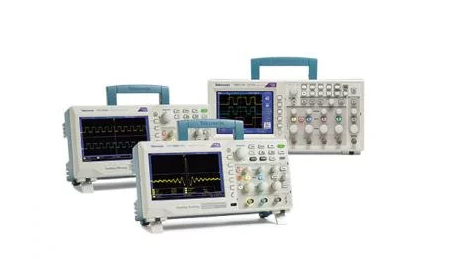 The intuitive user interface with dedicated per-channel vertical controls, zoom/magnifier button and convenient access to functions using the oscilloscope’s soft keys and multi-purpose knob make these instruments easy to use, reducing learning time and increasing efficiency. The built-in Help menu provides you with important information about your oscilloscope’s features and functions. Help is provided in the same languages as the user interface.